In medical school, students are trained on skills that will make them better future physicians, team members, and caregivers. It’s a curious thing—once we make headway into our medical careers and our days are filled with patient visits and paperwork, we rarely have the opportunity to assess our skill sets in the same way, despite the fact that new technologies and approaches to treatment have emerged since many of us attended medical school. As a hospitalist at Mount Sinai Hospital in New York, New York, I’m part of a team that cares for moderately to severely ill patients at a major academic institution. I’m also a physician advisor, and I have the pleasure of teaching some of the youngest and brightest medical students, interns and residents at various stages of their careers. I consider this the best part of my work, so I’m sure it comes as no surprise that I’m a firm believer in the importance of continuous learning. That’s why I was so excited when I had the chance to participate in three standardized patient (SP) encounters training designed for me and my 22 hospitalist colleagues to improve our communication skills, funded by a grant from The Doctors Company Foundation. What is a standardized patient encounter? A standardized patient encounter is essentially a live simulation in a clinical setting with trained actors. To start the simulation, a physician is given a short prompt about the patient scenario. They may also be provided with some basic information such as a diagnosis or a relevant imaging study prior to entering the room. Once the testing center provides a signal, physicians are allowed to enter the room. An introduction about our role on the medical team is provided and a discussion ensues. The actors provide relevant history, incorporate true emotional responses to questioning and display any behavioral or physical prompts that a real patient would. This allows physicians to react in real time to the needs of the patient. The use of standardized patients can also be adapted to desired testing scenarios, whether in the realm of communication, clinical reasoning, or establishing a differential diagnosis. Like many hospitals, we have a program in place aimed at assessing how we educate students and younger physicians. But Mt. Sinai is the first hospital in New York that has established a program designed specifically to assess and address some of the unique communication challenges we face as hospitalists to improve patient care. As hospitalists, we’ve never met patients or families before we must begin conversations at critical points of care. It takes sensitivity and particular thoughtfulness to create rapport and share substantial information with a hospitalized patient without having a prior relationship. Through the training, my colleagues and I each encountered three different SPs in key scenarios: one at daily rounds, one upset over a missed diagnosis, and one at discharge, when the potential for errors and miscommunication is greatest. We were videotaped during the encounters for our personal review and received direct feedback afterward from the patient. We discovered that we as physicians have become great at taking care of patients, but we don’t have enough opportunities to investigate which elements of our day-to-day communication need adjustment—or what good behaviors need reinforcing. It was extremely helpful for us to be able to watch the videos and ask ourselves, “Do I use medical jargon that’s hard for the patient to understand? Do I say things that aren’t warm and welcoming to the patient?” Then, by adding in patient feedback, we learned how we performed across these core domains, such as treating patients with courtesy and respect, listening skills, and explaining complex topics in an understandable way. 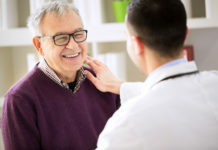 Strengthening these individual communication skills is paramount to improving patient comprehension, which in turn can improve patient follow-through on discharge instructions and reduce the risk of readmission. And as educators, our takeaways from the training can empower others in the healthcare system at large to better communicate with their patients. Mt. Sinai is proud to spearhead this innovative training effort in New York. In fact, since the initial date of the training, the three modules have expanded into a program run by The Morchand Center for Clinical Competence at the Icahn School of Medicine at Mount Sinai. So far, the Morchand Center has adapted the SP methodology for hospitalists to train 1,845 additional residents in various specialties across New York City. Nationwide, the entire medical community stands to benefit from continuous physician learning and partnerships that facilitate it, like The Doctors Company, which make trainings like this possible. At a time of tremendous change for healthcare, having a well-trained physician workforce is more important than ever before. Our patients deserve to be cared for by physicians whose knowledge evolves alongside the transformation of care delivery. Physician learning must keep pace with our industry’s transformation. By setting the bar higher for what patients should expect on a patient communication level, we increase patient safety, raise levels of patient satisfaction and drive quality care—no matter what the future of healthcare delivery looks like. Sit down to establish “eye level” communication. Introduce yourself and your role. Ask patients to explain their understanding of the care being provided. Always close an encounter by asking a patient if there is anything they would like to discuss. Eric Barna is an assistant professor of medicine at the ICAHN School of Medicine at Mount Sinai and an academic Hospitalist within the division of hospital medicine. His academic work focuses on graduate and medical education, curriculum development and innovative uses of technology in education. In addition to his clinical work, he is the associate residency program director for inpatient medicine and the subinternship clerkship coordinator for the school of medicine. Eric earned his B.S. In Biological Sciences with a secondary focus in Education at the State University of New York at Albany, his M.D. at the Medical School for International Health at Ben Gurion University in Collaboration with Columbia University and his MPH at Columbia University. He completed Residency and chief residency at the Albert Einstein College of Medicine, New York in 2009.